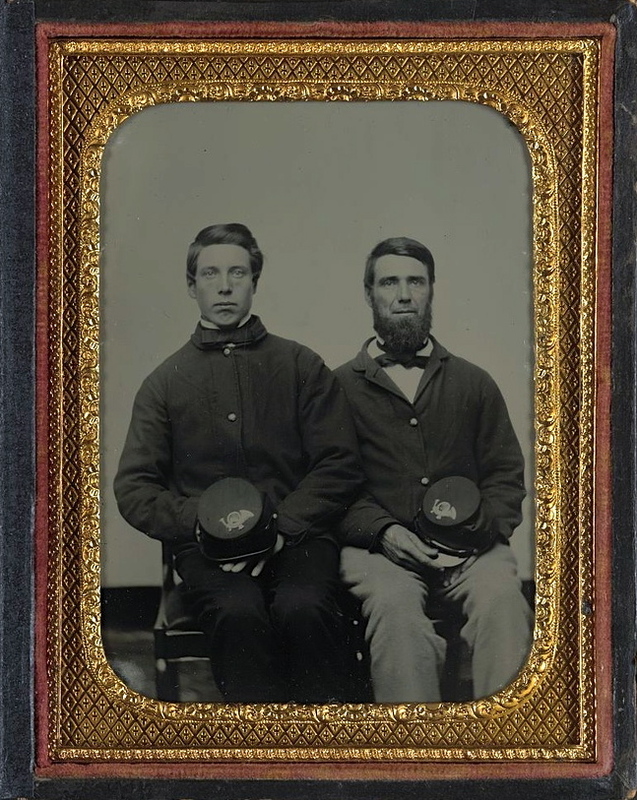 This letter was written by 50 year-old Joseph W. Kirkendall (1811-1866), a farmer, who was serving as a wagoner in Company F, 86th New York Infantry with his 16 year-old son James Myron Kirkendall (1845-1872). Joseph wrote the letter to his wife, Abigail (Hammond) Kirkendall (1816-1904) giving instructions for their 18 year-old son, Thompson Humphrey Kirkendall (1843-1915), to enlist in the same regiment and join them at their camp in northern Virginia a few miles from Washington D. C.
Joseph was the son of Cornelius Kirkendall (1774-1851) and Margaret Schleppy (1778-1866). In 1850, the Kirkendall’s farmed in Milo, Yates County, New York. 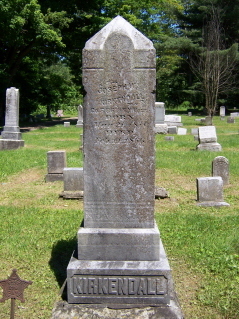 By 1860, they had relocated to Erwin, Steuben County, New York. I often go in Georgetown and Washington and pass the Capitol and the President’s House but as yet have not been in either of them. Elder Weber wanted to know where we are located. We are on what is called the Upper Potomac eight miles from Fairfax Courthouse. We have crossed the Chain Bridge. This stream as far as I have seen is very rocky and swift current — the banks rocky and steep. The country [is] very uneven but not mountains. There are exceptions and I think some excellent land and some as poor but it will never regain the havoc that this war has made for one century — especially in the timber. I don’t want any of my letters to the care of [Capt. Amos] Sherwood as he is not very particular who opens them. He will be middling low if he gets if he gets home in the eyes of his neighbors [?]. As soon as the roads gets settled, all of the army will advance on towards Fairfax and Centreville but there will be no more Bull Run affair. But the rebels will get their just due with interest. Now Thompson, I want you to shoulder your knapsack and come on. Come to Elmira and inquire at Headquarters and they will give you a pass at Sherwood’s Tavern where [Lt. Foster P.] Wood puts up at Elmira. He is a recruiting officer. Go to him. You cannot get a pass without remember[ing] the name of your regiment. 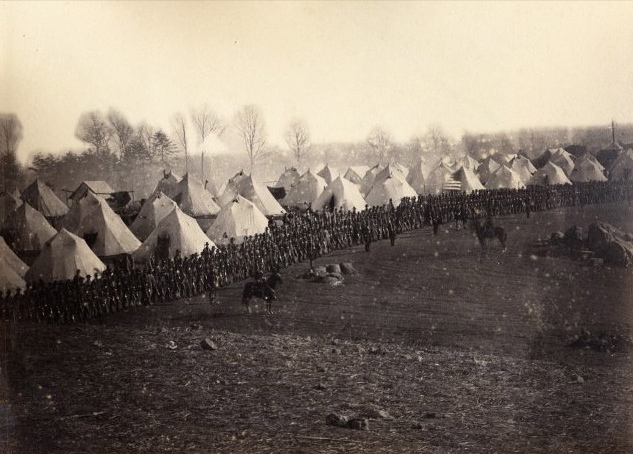 [We are the] 86th New York Volunteers and Colonel [Benajah P.] Bailey, Company F. We have not moved yet. Come to Washington and then inquire for 86th New York Volunteers. Inquire for Georgetown, then straight through the city of Georgetown. Then inquire for the Chain Bridge, then cross the bridge, then keep the turnpike up the hill. You can inquire every ten rods of soldiers and if you get belated and cannot get through, stop anywhere with the soldiers and make yourself at home as this is the soldier’s rule and all belongs to Uncle Sam. But be sure to know whether we are moved or not before you leave Washington. I think we may not move before you get here but I cannot tell. You may fetch a small box if you choose, a little lump of butter and two drawings of good tea as I haven’t tasted any good tea in the army. [You] ssk us about living in the army. We take it as it comes. But Abigail, I miss you when I want a clean shirt, or something to eat that I and Myron cannot get here to eat without paying too dear for the whistle. Now Thompy, keep your head right and you will find us about twelve miles from Washington in Virginia. We are now in Camp Griffin.¹ It is warm here and has the appearance of spring. This is February 23, still warm, but very muddy. There has an order come this morning for us to move back where we came from and it will be easy for Thompson to find us. I will write in another letter and give directions for him to come. My impression is that the cause of our being sent back is a deficiency in our leader. It wants men here that understands his business — I mean Colonel [Bailey] and Lieutenant Colonel [Chapin]. I am sorry to hear of the sick child. I truly think of my family and friends at home when I lie down and when I rise up and I truly believe God’s kind protecting is with me and I will trust his promises for they are sure. We have a dreadful road to travel tomorrow of 16 miles. We are going to Mount Hope or near there. I would be glad to hear from you occasionally. I now think we will not see any fighting as we are going to be placed out of harm’s way unless we are moved. ¹ Camp Griffin was located in present day McLean, Virginia, on the plantation known as Salona owned by Jacob Smoot. The mansion house served as the headquarters of General William Smith and other Union commanders. I am wondering if you are at all related to, or know of, dependents of this family? I have inherited a picture of Joseph and Abigail’s granddaughter Winnie Lee (daughter of Annette Kirkendall and Delos Lee). I would like to get it back into the right family. Thank you.